Our recent blog on Cahokia Mounds described the culture of the mound builders, whose handiwork all over the American landscape would have been part of everyday life for Meriwether Lewis and William Clark. 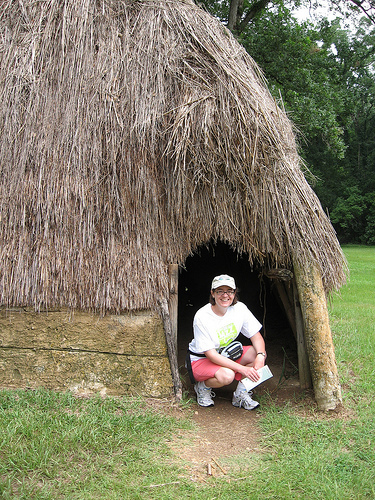 Cahokia Mounds is a great stop for those in the St. Louis area. Today I want to talk about a couple of sites that are equally fascinating and easily accessible to those retracing the last journey of Meriwether Lewis along the Natchez Trace. Emerald Mound was constructed about 1400. Second only to Monk’s Mound at Cahokia in size, it would have been the site of an enormous temple that served the ancestors of the Natchez Indians. It is believed to have continued to be used for about three centuries. Studying the residents and how they lived is frustrating because much of the site, including a number of additional mounds, was destroyed by farming before the National Park Service stepped into preserve it starting in the 1950s. 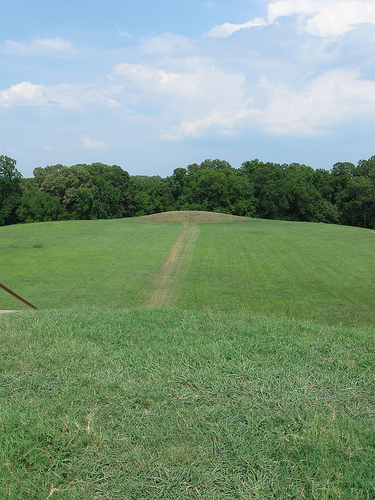 Today, you can easily walk to the top of Emerald Mound. These ancestors would have been among the Native Americans who violently repulsed the first Europeans to visit the area back in1542, when Hernando de Soto and the Spanish came calling. Unfortunately, the Spanish probably had the last laugh, as foreign diseases swept through the people of the area in the next decades. By the time the French ventured up the river 140 years later, the earlier civilization had been replaced by the Natchez, who lived not far from Emerald Mound in a city known as the “Grand Village.” Other smaller villages of Natchez Indians were scattered in the surrounding area. The Grand Village was impressive to the French, though its ceremonial plaza and temple mound were much smaller than those found at Emerald Mound and Cahokia (it is believed to have been constructed back around 1200 and then resettled.) At first it seemed that the French and the Natchez might have a lot in common. The Natchez were ruled by a man known as the “Great Sun” (not unlike the French Sun King) and his brother, the Tattooed Serpent. A highly complex and stratified society still held proudly to its traditions on a spot with some of the richest farmland in America and a well-tended forest loaded with deer, walnuts, and peaches, plums, and figs.The French established reasonably decent relations with the Natchez and documented many of their beliefs, ceremonies, and customs, which included human sacrifice, ritual suicide, and infanticide. In 1716, after four French traders were murdered by Natchez, the French set up a garrison known as Fort Rosalie. A handful of soldiers maintained the fort to protect French traders, those tobacco farmers crazy or desperate enough to seek their fortune in one of the most remote areas on the planet, their families, and their African slaves. The incident proved to the last stand for the Natchez. In the war that followed, the French, along with Choctaw allies, hunted down the Natchez and took a terrible revenge. The Natchez were driven from the Grand Village and other towns. Those not killed were sold into slavery in the West Indies. A handful escaped to join the Cherokee and Creek, but their civilization disappeared forever. The region was completely destabilized, and war continued among area Indians for years, with lasting consequences. The French chose to arm their slaves, leading to a path to freedom and a free black society that had a huge impact on the history of Louisiana. Archeological work began at the site of the Grand Village in the 1930s. Today you can visit the site, explore the mounds, and take in a small but very informative museum. I know there are many other surviving Indian mound sites in the United States, including other smaller mounds along the Natchez Trace. I’d love to visit many more sites. If you have a site you recommend, please leave a comment.